Don't miss out. There's only 4 available and 12 other people have this in their cart right now. Don't miss out. There's only 1 available, and 12 other people have this in their cart right now. - Smallest bowl 4.5" x 2.5"
- Small bowl 6" x 3"
- Medium bowl 7.5" x 3"
- Largest bowl 9" x 3.5"
These beautiful nesting bowls are hand thrown on my potters wheel from dark red stoneware clay and hand designed with a special slip trailing technique. They are glazed in my Aqua Mist color. The texture beautifully breaks through the glaze to reveal the design. PACKAGING - Each item is carefully packaged in bubble wrap and heavy duty boxes to insure a safe delivery. Gift wrapping available upon request. All designs, creative content, descriptions and images © 2019 Back Bay Pottery - All rights reserved. Beautiful; excellent quality. 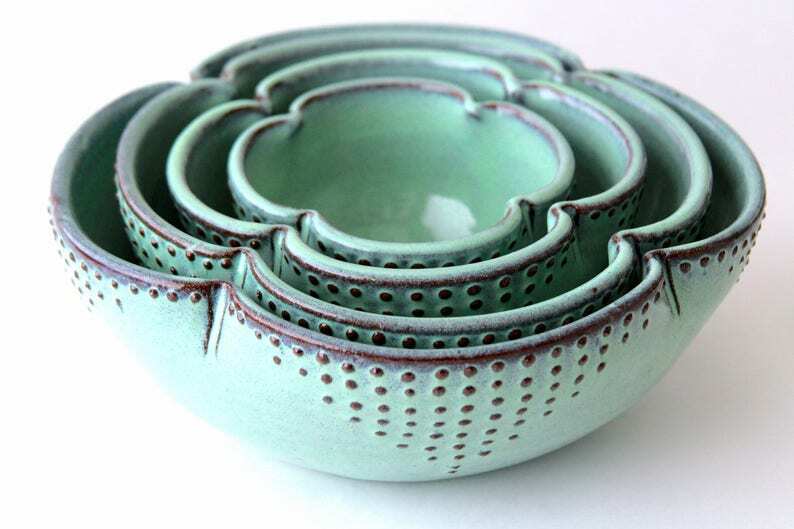 I have ordered several pieces from Back Bay Pottery and have always received it in the time stated and have been more than pleased with their products! 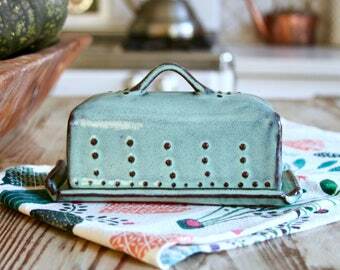 What can I say, I LOVE their pottery and will continue to purchase them for myself and as quality gifts! Five Star! I ordered the jumbo utensil holder and large spoon rest. Both pieces are gorgeous and of the highest quality. Highly recommend! Took a month or month and a half to receive but knew that going into it. Well worth the wait! My pottery is food, microwave, oven (to 400°) and dishwasher safe. Hand-washing is recommended. Due to my volume of orders and the time involved I am not accepting custom orders. Most of my pottery is Made to Order and takes 3-6 weeks to make (depending on the order it can take longer). Check the shipping tab on the item you want to purchase. I do my best to keep this updated. The estimated shipping time is listed on your order receipt. I always send a message letting you know when your order has been shipped. I am not accepting wholesale orders at this time. You can have the gift shipped directly to the recipients & I will be happy to include a note so they know it's from you. There is a place to change the shipping address at checkout and you can leave your note in the message box. * Because your receipts are available electronically, I do not include them with your purchase. Due to the amount of orders that I receive I cannot accept rush orders. MADE TO ORDER - When will my order ship? Most of my pottery is "Made to Order" this means I will start making it after the order is placed. >> Most of my pottery takes 4-6 weeks to make. >>> Dinnerware and Larger orders take 8-12 weeks to make. Sometimes there is delays (this is the nature of ceramics). If this happens I will let you know. Packaging - How is the pottery packaged? Getting your pottery safely delivered is our #1 priority! We package in boxes within boxes and add lots of padding. If there is any damage your item will be replaced. Larger items are safely packaged in padding and heavy duty boxes to insure a safe delivery. Gift wrapping available upon request. Is the pottery food safe? Yes all our pottery is food safe, lead and cadmium free. Please be aware that there are color variations with every computer monitor and the color may look different in person than the color you see on your screen. Contact me for color samples. 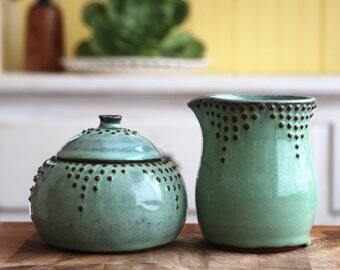 The translucent glazes, mainly Spicy Mustard, Emerald Green, Hyacinth and Deep Sea Blue, have a crackle effect. It is a characteristic of the glaze. It crackles most when it goes through its first wash. It will not affect it use or ability to hold liquid. This is do to the expansion and contraction that occurs with temperature changes.